West Side Story remains a bit of a conundrum. More than 60 years after its first appearance, it continues to fascinate for its mixture of conventional musical theater with ballet, witty lyrics on a Gilbert-and-Sullivan level, and a healthy dose of “opera.” Francesca Zambello’s high-end production, which opened at the Lyric Opera of Kansas City on September 22nd, embraces these contradictions and in so doing reveals, among other things, why it was such a struggle getting this thing onto the Broadway stage in the first place. Even today we’re not quite sure what to make of its dance numbers, its near-operatic roles for Tony and Maria, and the undercurrent of silliness inherent in Arthur Laurents’ book (street toughs who never swear and who like to show off their pliés, gangsters who gather to discuss, with great civility, “fighting fair”). It was a courageous season-opener for the Lyric Opera, perhaps, intended partly as an homage to composer Leonard Bernstein and choreographer Jerome Robbins, both of whom are being celebrated for birth-centenaries this year. (See our advance feature story here.) Originally a co-production of Houston Grand Opera, the Glimmerglass Festival and the Lyric Opera of Chicago, this contemporary Romeo and Juliet comes with an elaborate and strikingly attractive set design by Peter J. Davison (and attention-grabbing lighting design by Mark McCullough). Two gigantic “walls” hinged at the wings swing down- and upstage to create various urban settings: a tenement exterior, Doc’s Café, the side of a bridge (? ), and an upper-level fire escape (“Juliet’s balcony,” as it were) that rotates to reveal Maria’s modest but color-splashed boudoir. In keeping with the spirit of the original concept, the Jets and Sharks danced and sang with the razzmatazz of musical-theater performers, while Vanessa, Andrew and Brian sang with the more refined sound of opera singers (and moved with slightly less ease). Andrew struck just the right vocal balance in “Something’s Coming,” in which he sounded like a trained, “legit” singer who occasionally, in the upper range, lapsed into a more open sound. He knew how to vary his tone color, and he could stay with the orchestra, too. Brian was equally comfortable in delivering a less formal sound, while Vanessa on the other hand sounded like a real operatic soprano much of the time. 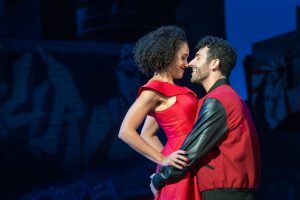 DJ Petrosino played a convincingly menacing Bernardo, and Gabrielle showed herself to be a “total performer” in the sense that her dancing, acting and singing all merged into a total picture of a “fiery” Latina (the stereotyping stemming from the authors, not the performer). 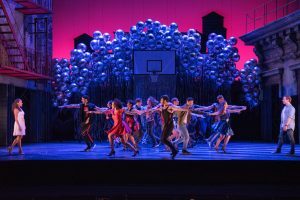 Robbins’ original choreography, as lovingly restaged by Julio Monge, felt as fresh as it must have seemed in 1957: It’s easy to see how this musical changed some of Broadway’s presuppositions about the role of dance in musicals. 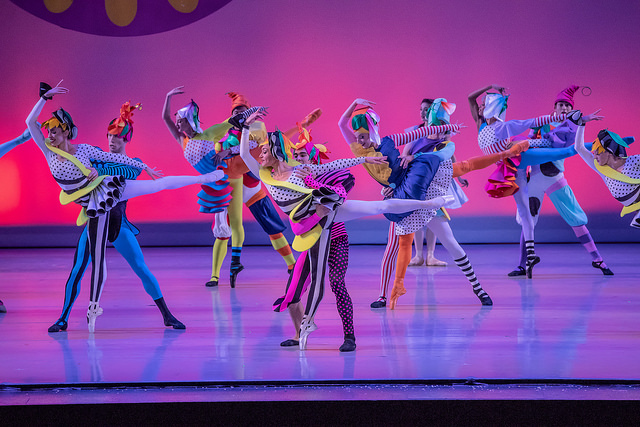 Robbins’ melding of jazz rhythms with the symmetrical patterns he inherited from Balanchine made the opening scene riveting, and the Gym Dance was something you simply could not take your eyes from. Some of Sondheim’s best lyrics are found in the wittier songs such as “Gee, Officer Krupke” and “America,” though there is tender poetry in “Somewhere” that matches the musical setting neatly. Vanessa sang the latter with graceful flair but with a deliberate quality that kept it grounded. When she joined Andrew in “One Hand, One Heart,” they sounded quite splendid together. 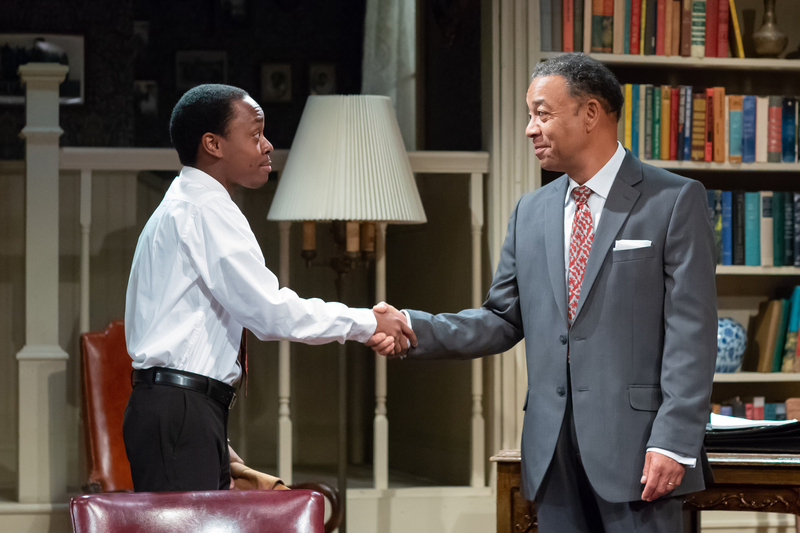 T. J. Lancaster and Nathan Whitson did their best with the mildly buffoonish cop roles that the authors have provided, while J. Robert Paisley (as Doc) painted a sincere portrait of an embittered grown-up who despairs for the future of America’s ysuth. Yet for all the beautifully crafted choreography and inventive set and costume designs, for all the solid singing and dancing, what really stood out here was the Kansas City Symphony in the pit. Because when you hear Bernstein’s score performed by a top-drawer orchestra, led by a consummate conductor such as David Charles Abell (whose mastery of the score was enhanced by his quick adeptness at “staying with” the singers), you realize that this is really the reason we’re still watching West Side Story. Its jarring dissonances, its stubborn clashes of brass-and-winds versus strings, its breathless melodies: The music leaps out at you at every turn. 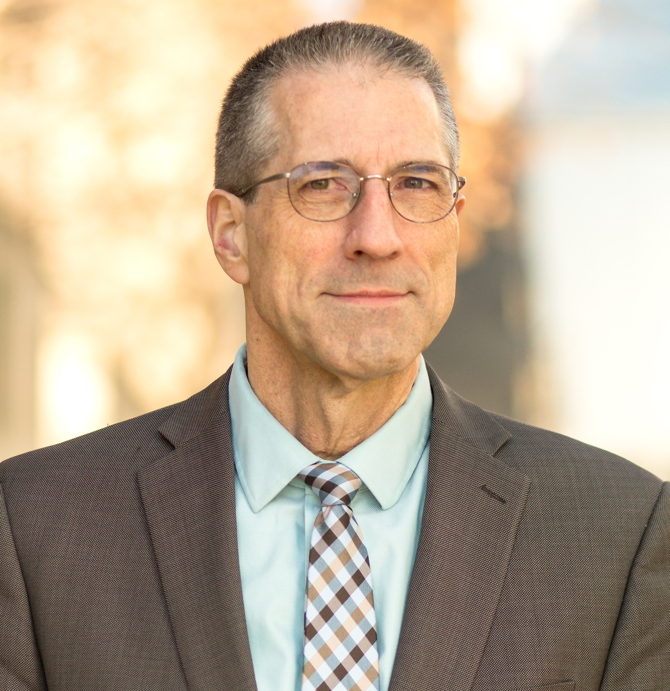 And although the work’s themes of urban strife and gang violence continue to echo, none of these elements would have stood the test of time had it not been for the vastly superior contributions of this great American composer. 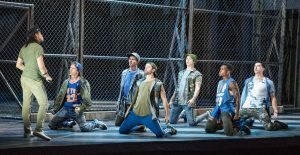 West Side Story runs through September 30th at the Kauffman Center’s Muriel Kauffman Theatre. 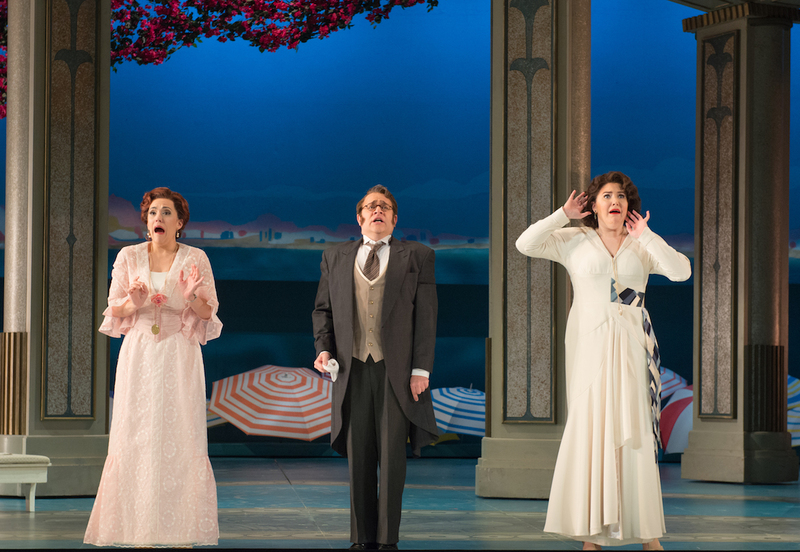 For tickets call 816-471-7344 or go to www.kcopera.org. 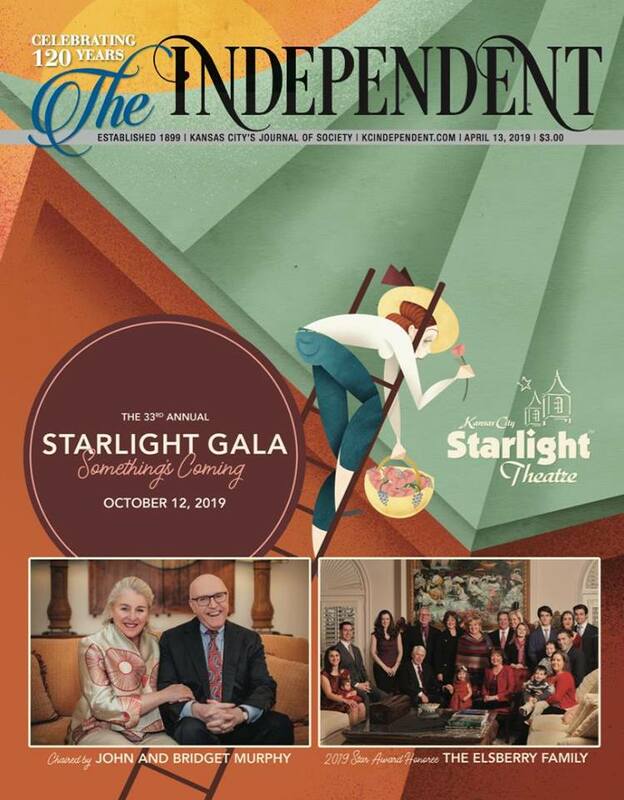 To reach Paul Horsley, performing arts editor; send an email to saul@kcindependent.com or find him on Facebook (paul.horsley.501) or Twitter (@phorsleycritic).